Watching Olympic figure skating on the NBC Olympics website, I saw a huge number of ads for Amazon’s Echo Dot at a discounted price. But the ads didn’t convince me that I wanted to buy one — and if someone gave me one as a gift, I’d give it away. For me it would be clutter. I know that devices like the Dot can be very useful to those with disabilities, but I’m fortunate enough to not have any such disabilities at the moment. I also know people with small children who say devices like the Dot provide their kids with endless entertainment, but I don’t have children. I have a small home, so I don’t need the Dot to control smart lightbulbs — I can get up and turn on any light in the house with just a few steps. Similarly, I can easily get up and adjust my thermostats, so I don’t need to use the Dot to adjust a smart thermostat like the Nest. I order very few things from Amazon and I don’t even have Amazon Prime, so being able to say, “Alexa, re-order paper towels” isn’t a benefit to me as it would be to other people. I don’t play music when I’m home, and I don’t subscribe to any streaming music services, so voice control of my music — a big deal to some other people — is irrelevant to me. Similarly, I don’t listen to audiobooks, so I wouldn’t use an Echo for them. And I read the news rather than listen to the news, so the Echo wouldn’t be useful to me for that purpose, either. All Alexa accounts come with a shopping list, so you can tell the Echo to add something to your shopping list and then use the Alexa app on your smart phone to see the list when you’re in the store. I can see how this could really be helpful for some people, including couples — one person could add to the list that the other person would be using to shop later in the day. But for me, the Notes app on my iPhone is really all I need. I’m perfectly happy using my smart phone as my alarm clock and my timer. I don’t need another device to provide those functions for me. 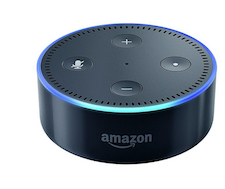 I’m not at all trying to disparage anyone who has an Echo (or a Google Home device or an Apple HomePod). If these make your life easier or bring you joy, that’s great! And I very much appreciate many new tech tools. I’m just suggesting that we all consider our own circumstances before we decide to buy the latest tech gadget, whatever that might be. 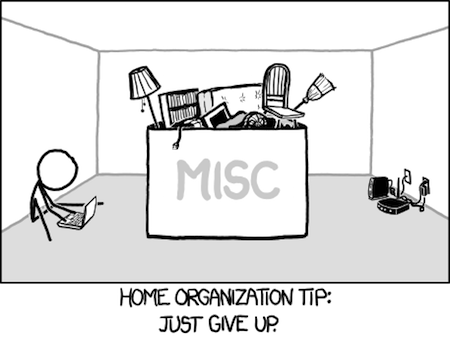 Dave just wrote about the hidden benefits of uncluttering, and that reminded me of the stories I’ve been collecting that illustrate the benefits of getting organized. Many of the stories have to do with saving money. Mike Isaac tweeted about having to absorb a $313 airline ticket change fee because he couldn’t find the receipt so he could get reimbursed by his employer. And it can get worse. Mike also tweeted about forgetting to pay a bill for a few months, having it go to collections, and seeing his credit score take a big hit. Finally attacked and organized the spice cabinet. If you have a recipe that uses 137 tablespoons of cinnamon and an equal amount of paprika, let me know. I treated myself to a set of multi-color Akro bins. Oooo! Aaaah! So pretty! So sturdy! So stackable! So open in the front for easy access, no matter how high the stack! Another benefit comes about in a situation I hope you don’t need to face: evacuating your home. Someone I know had to evacuate when her large apartment complex had a fire. (Fortunately, the fire didn’t reach her unit.) When she had to leave, she was able to grab all her essential items in about a minute because she knew exactly where everything was, and all her most important things were in one of three places. And being an organized person, she immediately reflected on what she overlooked so she could do an even better job if she ever needed to evacuate again. We’ve written about taco holders on prior Wednesdays: the Taco Truck and the TacoProper. 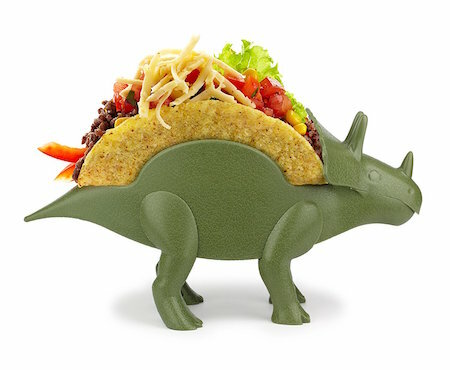 But I just came across the TriceraTaco taco holder, and couldn’t resist revisiting this subject. You don’t use the flat-bottomed taco shells that stand up fine on their own (and wouldn’t fit in this holder). You have plenty of space to store this taco holder. You (or your family members) would be delighted every time you used it. However, it’s also worth remembering that what seems cute at first glance will sometimes wear thin in repeated uses. Would you still like the TriceraTaco on the 20th use? If you have a fairly recent cell phone that you want to sell or donate, it’s pretty easy to remove your personal information (address book, messages, photos, etc.) from the phone before disposing of it. You can get the how-to information from your cell phone manufacturer or cellular provider, or you can find information online from various other sources. In general, the steps will involve removing any SIM cards and SD cards, doing a hard reset (also known as a factory reset), and setting up encryption if needed (especially on Android phones). To be even more secure, you can load junk data onto your phone and then do another factory reset. But what if it’s an old phone and you don’t have the charger, you don’t know the password, or both? These phones tend to get shoved into drawers or boxes to be dealt with at a later time — which never comes. According to the Canadian Wireless Telecommunications Association, which advocates on behalf of the industry, 62 per cent of Canadians have an average of 2.1 phones that they’re not using. That equals more than 47 million unused cell phones collecting dust. If you’re dealing with phones like this and you’d like to finally unclutter them, the following are a few suggestions. Missing the password? Try the default lock code or just do a factory reset. Leaving a default lock code in place is a bad idea, but enough people do it that you might as well try it. Many years ago, the person who used the phone might not have been as security-conscious as most of us are now. The default code on many Nokia phones is 12345. The code on some LG phones is 0000 (four zeroes) and on other LG phones it’s the last four digits of your phone number. Other phones might use 1234. But the easiest option might be to do a factory reset (which should be possible even without the password), since you want to remove all of the data on the phone, anyway. Missing the charger? See if someone else has one. A vendor’s store may have the charger you’re lacking and might be willing to charge your phone enough that you can follow the standard steps for erasing your phone. Or ask around on sites like Nextdoor, where you might find someone who would be happy to lend you the charger you need. Still stuck? Physically destroy the phone. If you can’t get into the phone to erase the data, you can always resort to physically destroying the phone. Some people distrust the software erasing process and prefer hardware destruction, even though it could mean a perfectly usable phone gets destroyed. It’s all a matter of what data you have on the phone and how you evaluate the risks of having that data stolen. While you could attempt to destroy the phone yourself — if you know what you’re doing — many people will find paying a reputable service provider to shred the phone to be the wiser choice. Some local shredding companies will shred cell phones, including companies with certification from the National Association for Information Destruction (NAID). You can search for a company through the NAID website, although there’s no way to identify which ones work with cell phones as opposed to just paper and storage media such as computer hard drives. Alternatively, you could just use your favorite search engine. How long will it take me to unclutter and organize? I’m often asked how long it will take to complete an organizing task: organizing a garage, a kitchen, a closet, an office, etc. As with almost everything related to organizing, the only honest answer I can provide is, “It depends.” And it depends on a number of factors. How much stuff is currently in the spaces you want to organize? Rooms of the same size and same basic purpose may hold drastically different amounts of stuff. Drawers can be stuffed to the brim or only half full. Garages may have been unable to accommodate a car or truck for years or may have plenty of room for vehicles. What kinds of things are in the spaces? Papers take a long time to go through, because each paper must be reviewed, and each paper takes very little space. You’re making a decision about each paper the same way you’d make a decision about a shovel, a toaster, or a couch — but you won’t see results as quickly. Also, sentimental items take a longer time to unclutter because of the emotions involved. What kind of decision maker are you? Some people make decisions quickly: Keep that, toss that, donate that. Other people need more time to make their decisions. Someone might want to tell me the story behind an object before deciding on its fate, and that’s perfectly normal and understandable. How long can you reasonably work at an organizing task? When organizing, you want to avoid both physical and emotional fatigue. Uncluttering involves making one decision after another, and you want to avoid decision fatigue — because that’s when you’re likely to make decisions you may regret later. If you find yourself dreading one more “keep or not” choice or your body is getting uncomfortable, take a break or just decide you’ve done enough for the day. How many people need to be involved in the decisions? If you live alone and can make all the uncluttering and organizing decisions, things are likely to go more quickly than if multiple people need to agree on the decisions — especially if the people involved have different organizing styles and will need to reach compromises. What do you want your final organized space to look like? If you’re organizing a new kitchen, do you want to put down shelf liner first? If so, it will take longer than if you decide you don’t need shelf liner. Do you want all your books organized in a very specific order? If so, that will take longer than if you just want them in general categories. How do you want to dispose of unwanted items? The organizing project isn’t really done until the items you aren’t keeping are no longer in your space. If you want to sell them, that’s likely to take longer than if you choose to donate them. But very specific donation goals can take time, too. I know people who have kept things around for months because they wanted to donate them to a specific charity’s once-a-year garage sale. Unless you need to clear out a space quickly, I’d generally advise working at whatever speed feels most comfortable to you. Once you’ve begun the process, and see how much time it’s taking you to do parts of it, you’ll have a decent idea how long it might take to do the rest. Eight-year-old Daerye Neely and mom Dionna Neely walked into their new home in Detroit to find a wonderful surprise – a furnished home decorated for free by charity Humble Design after the co-founders heard about the Neelys’ story of hardship. Since I’m always looking for good places for people to donate the gently used items they no longer want or need, I wanted to know more — so I started investigating. Humble Design is “a non-profit helping families transitioning out of homeless shelters by providing furnishings and design services. We turn their empty house into a clean, dignified, and welcoming home.” And given that mission, it takes a wide range of donations: furniture, rugs, artwork, linens, towels, books, toys (excluding stuffed animals), TVs, dish sets, silverware, mugs, and more. Pick-up services are available for large furniture items, although only in certain areas — and there’s a wait list. I’ve written about furniture banks before, and many of these accept more than just furniture. For example, see the listing for the Furniture Bank serving greater Toronto, Canada. Furniture banks, working with partner agencies, provide a great service for “the previously homeless, unemployed and working poor, battered women and children in retreat, immigrants, individuals with mental or physical disabilities, victims of a fire, robbery, and natural disasters, etc.” And these items are provided at little or no cost. All of these organizations have specific wish lists and standard donation guidelines. 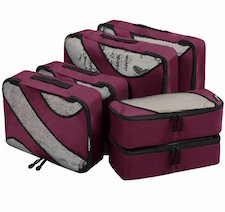 None of them want items with stains, odors, rips, or any other major wear. Linens and towels should be washed before donating. If you have household furnishings to donate — especially furniture, which many organizations don’t handle — furniture banks and organizations like Humble Design are good to keep in mind. These are the most common approaches, and they are often combined. For example, you might put all science fiction together, organized by author. It’s up to you to define genres (and sub-genres) as you wish, depending on how you classify books in your mind and how many books you have. You could also use one of the library classification systems: the Dewey Decimal Classification or the Library of Congress system. I tend to organize by genre and I keep all books by any one author together. However, that’s as detailed as I get — I don’t organize authors or titles alphabetically. But some people find alphabetizing to be helpful, and some will add a chronological component: organizing books by each author in the order they were released, organizing history books from oldest time period to the most recent, etc. While this can create an interesting look, does it interfere with finding a specific book when you want it? Not always, since some people remember book covers and colors. You could also choose this approach for the books in just one space — it doesn’t have to be the approach taken for all your books. This is often a compromise from a genre/author approach, when some books just won’t fit with the others. Or it could be a second-tier organizing strategy, where books within a genre get organized by height. But you might also choose to organize by height — especially for really tall or really short books — to make the best use of limited bookshelf space. This works best when you can adjust the shelves to just the right height. I have one shelf that’s a collection of super-short books. And as with books organized by color, some people just like the look of books organized by size, and use it as their primary sort. This would be an approach to use in combination with another one, where all the to-be-reads are kept together (and organized however you wish). All the ones you’ve read and are saving would be kept separately (and also organized however you wish). Some readers like to keep all their favorites together, and then use whatever other system they want for the rest. This especially makes sense if you tend to re-read these favorites frequently, or if you often loan them to friends. If you have a guest bedroom, you might want to put some favorites in there. If you have books in multiple languages, your first sort might be by language. Within each language you could then organize by author/genre or whatever other approach appeals to you. What I like about that disorder is that it allows that element of surprise and serendipity. When I’m looking over my shelves, trying to figure out what I’m going to read next, I don’t know where everything is and that enables me to be surprised. And a note about shelving techniques: There’s been some recent attention to the practice of shelving books backward, with the spines inward and pages outward. While I’ve seen many people deride this, it winds up that some neurodiverse people find this a much less stressful look. I had never considered this, and I’m thankful to C. L. McCollum for sharing that perspective. I have bags of slightly used stuffed animals. I’ve found most places like hospitals and day care center don’t want them because of germ contamination. Where can I find a site that would welcome them? How about for the flood victims in Texas or hurricane victims in Florida or even … victims in California? Give me some ideas please. Darlene, this is a common concern, so I’m very glad you asked the question. The following are a few suggestions that may help anyone with gently used stuffed animals looking for new homes. I’ve successfully used my local freecycle group to give away stuffed animals. It doesn’t always work, but it sometimes does. Other similar possibilities are Facebook, Nextdoor, and the free section of Craigslist. While many thrift stores don’t accept donations of stuffed animals, a number of them do! Each Goodwill chapter has its own policies regarding what it accepts — and some specify that they take stuffed animals, such as Goodwill of the Heartland in Iowa and Goodwill of San Francisco, Marin and San Mateo Counties in California. The St. Vincent de Paul Society of Lane County in Oregon is another example of a charity that takes stuffed animals for its thrift stores. Again, each local organization will have its own policies, but you might find that yours will welcome your donation. Note: These policies can change over time, so be sure to check before each donation. Edmund D. Edelman’s Children’s Court is the court that handles all the juvenile dependency cases in all of Los Angeles County. These cases usually deal with abuse and neglect issues. Annually they handle about 30,000 cases, and some of these cases require the children to speak. The courthouse has asked us if we could donate stuffed animals to help ease these children’s fears during a very stressful time in their lives. SAFE also has good instructions for cleaning stuffed animals (PDF) before donating them. An 8-year-old girl in Colorado who had been in an auto accident donated her stuffed animal collection to the Denver police department to give to other children like herself. You could certainly ask if your local police or fire department would like your stuffed animals to hand out to children in similar traumatic circumstances. As reader Monique mentioned in the comments, this is always an alternative to consider. And it will work for toys that have stains (even after washing) that would make them unsuitable for giving to children. Please check with the shelter you have in mind, as not all of them will want such donations. But some, such as Four Peaks Animal Rescue in Arizona, do include stuffed animals on their wish lists. Helen Rosner recently asked on Twitter, “What are some tiny things you’ve done this year to make your life immeasurably better?” She got a lot of responses, and I noticed many of them had to do with organizing and uncluttering. Lots of people wrote about improving their closets. One person bought 100 identical hangers from The Container Store to replace her old mismatched poor-quality ones. Someone else got “the black velvet ones,” which would be the Joy Mangano Huggable Hangers or an equivalent. “Closets fit so much more, it’s easier to see what’s in there, and clothes don’t get stretched in weird ways from hanging,” she wrote. While I understand the visual appeal of identical hangers, I haven’t yet gone that route myself — although I’ve been tempted. But I did just buy some more Olka hangers, since they’re the best I’ve found for preventing shoulder bumps. Whatever hangers work best for you, so clothes stay put and maintain their shape, can be a worthwhile investment. Other people wrote about the benefits of owning duplicate toiletry items: one for home and one for the travel bag. For those who travel a lot, this can be a time-saver and a stress-reliever. But while Kirk England wrote, “Best $40 ever,” Bryna Levin wrote, “Except for women it’s $100-$500.” I don’t think it’s just gender that defines how expensive it would be to duplicate the toiletries — I don’t use all that many products so my cost would be well under $100. An alternative approach, for those who don’t want to make the investment, would be to develop a good packing list. Other small purchases also helped people be organized and save time. Leon Overweel did the often-mentioned trick for avoiding mismatched socks: “I ordered 50 pairs of basic black socks off alibaba for $22 (including shipping) and removed all other socks from my drawer. Now every morning I blindly grab two and just put them on. No more orphan socks or matching socks in the laundry!” While 50 pairs of socks is more than many people would buy, the basic concept is sound — assuming you often wear basic solid-color socks rather than more flamboyant options. Someone else added a towel hook closer to the shower. And a number of people mentioned the benefits of buying long charging cords for their mobile phones, to work around inconvenient outlets. I got a long charging cord back in 2015, and I find it invaluable. Uncluttering was another big theme. Haley ED Houseman did what she called a “product purchase cleanse” where she used up (or gave away) the consumable products she had before buying any more. (Things that were too old got tossed.) Cathy Lanski said she “donated a bazillion sample sized products to a women’s shelter. They were sitting in a basket stressing me out, but were probably a treat to them.” A lot of these were “not quite right products from subscription boxes.” If you’re one of the many people with a large collection of toiletries, this could be the type of change you’d like to make, too. And I was delighted to see one person write, “We use grandma’s good china.” If you’re going to own “good china” it’s wise to actually use it and enjoy it. Not everyone agreed about all the suggestions. There are the fervent bed-makers and those who feel that making the bed is a waste of time. There was one person who was delighted with her new honeycomb shaped drawer organizers for her underwear and those who refuse to fold undergarments. That’s only to be expected — organizing solutions are very personal. My own small change this past year was storing some things more conveniently for my cat sitter — which meant the things were also more convenient for me. I just needed that “cat sitter is coming” push to get me to do some rethinking. Are you considering some resolutions related to uncluttering and organizing? I always find it interesting to see how other people have approached this, because other people’s ideas can inspire some of my own. I’m hoping some of the things I’ve seen recently might inspire you, too. A recent Mutts comic strip had one character who made a list of resolutions — for another character, not for himself. While that’s obviously not what I would recommend, it made me think that sometimes other people who know us well may have helpful insights and suggestions. Not shopping saves an astonishing amount of time. In October, I interviewed Tom Hanks about his collection of short stories in front of 1,700 people in a Washington theater. Previously, I would have believed that such an occasion demanded a new dress and lost two days of my life looking for one. In fact, Tom Hanks had never seen any of my dresses, nor had the people in the audience. I went to my closet, picked out something weather appropriate and stuck it in my suitcase. Done. Patchett has decided to continue her no-shopping approach for now, even though the year is ending. That sure sounds like a resolution that worked well for her. Select something to stop doing this year. … I mean something worthwhile, but that, if you’re honest, you don’t have time for. In our hyperbusy era, there’s an infinite number of potential things to do: emails to read, groups to join, ways to become a better person, parent, employee. Yet still we proceed as if “getting everything done” might be feasible. It isn’t. … Quit your book group; stop struggling to make dates with that hard-to-pin-down friend; accept you’ll never be a good cook. Not because those things are bad; because it’s the only way to do other things well. Note: One of my own 2018 resolutions is to get back to reading more books, and I’m definitely not quitting my book group. But if I’m going to read more books, that means I need to figure out other things to stop doing. Louise Hornor had a line in her quilting blog that resonated with me: “I resolve to keep on doin’ what I’m doin’.” If you have found ways of managing your stuff, your papers, and your time that work well for you, there’s no need to change.